The color was porpoise gray — that’s “porpoise” like the dolphin. Porpoise gray. That’s the color my wife chose to paint the little sunroom at our house a few years ago. She loves it when I take on house projects, and this was one that I was happy to do. So I started it and was making good progress. And then one of the nights, while this project was going on, my wife was having a night out with some friends, I had the kids by myself (just three at the time, ages 5, 3, and 1). Well, we were on the way home this night from dinner. It was almost their bedtime, and the plan was to get them all in the house, get their PJs on, and tuck them in bed. I unlock the door, let them in, go back, and get our son from his carseat. And if you know anything about carseats, you know that this is already not good for one’s stress level. And as I’m unbuckling him, I hear a scream coming from my house, from the kitchen. And then I hear my oldest daughter say, “Dad! Hannah fell in the paint!” So I hurry and try to open the screen door, but it randomly gets stuck. Seriously, it is jammed or something. I’m hearing this screaming and I can’t get in. At this point is when things start to go into slow motion. I stepped back, kid in one hand, keys in the other, and I kicked the door handle, and it opened, and I ran in the house, to the kitchen, and when I round the corner I see . . . porpoise everywhere. But not just the paint, my three-year-old little girl is laying in the paint on her back, simultaneously screaming and flapping around. And it was here, in this moment, when I seriously almost lost my mind. I had this almost outer-body experience as I was looking at this event unfold before me. I could hardly believe what I was seeing. And in a calculated, controlled kind of way, smoke began to bellow out of my nostrils, and I sinned. Now sin is always stupid, and when you sin, you look stupid. But in that moment, contrary to what we might think, anger itself was not the problem — my sin was why I became angry. Sin is always stupid, and when you sin, you look stupid. See, the thing with anger is that it is always a response to something else. Anger is never original. It only exists as an emotion that is reacting to something outside itself. This way of thinking is pretty standard fare when it comes to the topic. A recent book on anger for a wide audience explains that we become angry when we encounter a reality that we find unacceptable. When we experience something we don’t like, something unacceptable, we get angry — which tells us that the only way we can understand anger is to look at those things we find unacceptable. And the way we discover those things that are unacceptable is to look at the things we love. Human beings are essentially lovers. That is who we are fundamentally. We are affectional creatures, worshipers. And what do we do with the things we love? We care for them, we protect them and guard them and advocate for them. When our loves are threatened, we react — we get angry. Tim Keller has said that anger itself is actually a form of love. Anger is love in motion to protect the thing that we really care about. Which means, the opposite of anger is not being nice, it’s indifference. The opposite of anger is not caring about anything. If you want to know why you get angry, just look at what you love. We were created to love God most and best, but as sinners we value ourselves and the things that serve us more. This is the age-old problem that curves us in on ourselves and hoists up good things as ultimate things. This is where anger goes haywire — and sadly, this is why most of us get angry. See, we wish that the only thing that made us angry was the careless pizza delivery guy who speeds down our street while our kids are playing in the front yard, or we might like to think that it’s the horrific injustices in the world that really get us going. But actually, if we are paying attention, we find ourselves just fuming about little things that inconvenience us. Day in and day out, do you know what we Americans really get angry about? It’s not ISIS or abortion or human trafficking. It’s traffic jams, it’s when the zipper gets stuck on my new North Face jacket, or when Chipotle doesn’t put enough chicken in my burrito bowl, or maybe when we feel under-appreciated. See, most of our anger, our sinful anger, happens when we are so blinded by our self-consumed love of self that we find reality unacceptable if it is not serving me and giving me what I want. Simply put, if we find ourselves getting angry a lot, it’s because we love ourselves too much. What am I loving so much right now that is making me respond this way? What is it that I value, that I really care about right now in this situation, that is making me feel angry? The end of sinful anger can only come when we experience the transformation of our greatest love and devotion. If I could go do it over (and there’s been several do-overs), I would have stood in my kitchen, looked out at the paint all over the floor, and I would have asked that question. I would have stopped and thought, What do I really love right now? And I would have, God willing, repented. I would have realized that my real affection in that moment was not my children. When I was standing there, looking at all the paint, and hearing all the crying, I wasn’t loving my children and feeling concern for them. All I could think about was what I had to clean up. How offended I was that they didn’t listen. How annoyed I was that I had to wash the paint out of our daughter’s hair. Me. Me. Me. That is who I loved. That is why I got angry, and therefore, why it was sin. But it is sin that does not have dominion over me. It is the sin to which I am dead, sin from which I am set free. So next time, maybe today, tomorrow, oh to know the mind of Christ! That is what we need. To love what he loves, to desire his glory, to be melted by his grace, to soak in his supremacy and pursue his will so relentlessly that even in the midst of chaos, when there’s paint all over the floor or when people are reviling you, that we can, like him, love others more than we love ourselves for the greater joy set before us. Jesus, help us to love you, to love what you love, and to love others in your name. Amen. Jonathan Parnell contributed a chapter on anger in the book Killjoys: The Seven Deadly Sins. Electronic versions of the book are free of charge at desiringGod.org. Print copies are available through Amazon. 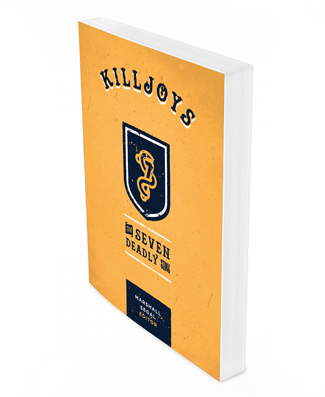 Killjoys was written to lead you deeper in love with our God and further into war against your sin. Pride, envy, anger, sloth, greed, gluttony, and lust are woefully inadequate substitutes for the wonder, beauty, and affection of God. This short message was part of the 2015 Conference for Pastors.